I have two brothers, both younger than me, but only one that I think of as my ‘little brother’. He’s called Andy and he was born when I was six and going to Karori Normal School. My brother Pete is so close in age I can barely remember a time in my life without him (he was my first best friend), but I remember the day Andy was born. I drew a picture at school of what looked like a tadpole with a baby’s face – Andy in his white blanket. You couldn’t see his fuzz of red hair. I wrote underneath about ‘my baby’, and about how I liked bathing him and looking after him. When he started walking I was Andy’s unpaid protector, dragging him from the edges of bush tracks and wharves, sure he’d die a terrible death (and convinced my mother wasn’t paying enough attention.) Later, I rolled my eyes when his little friends came over and played cars and Lego – brmmm, brmmm etc. Boys! Andy liked collecting things, small things. He ate the cuffs of his jerseys. He was loud and sticky. His hair got redder and redder, and he got taller … and taller. When I was writing Dappled Annie and the Tigrish, I gave Annie a little brother called Robbie. He’s six years younger than Annie – he’s 4 and Annie’s nearly 10 – and like my brother Andy, he’s loud and sticky, and likes collecting small things. He collects them in his pockets so that when he walks he rattles. His father calls them the shinies. I hadn’t expected Robbie to be such an important character in the book. When I first wrote it, he stayed at home with his mum while Annie went on her adventure with the tigrish. But he didn’t like that. Neither did I. I kept feeling something was missing. So I rewrote the book and found that (without being asked) Robbie charged off on the adventure too. Much to Annie’s annoyance at first – because he is loud and he is sticky and he is 4 … but, like all little brothers, she discovers he has his moments. When they’re stuck in the Giant Wood with all sorts of scary things going on, Robbie’s collection of shinies and ‘commando moves’ help save the day. Robbie has a lot of my brother Andy in him, but he has other important little boys wrapped up in him too: especially my son Adam and godson Ned – who were/are both loud and sticky and smart and adventurous. There are glimpses too of my brother Pete and son Paul who did less of the loud, sticky, physical thing and more talking, and two little boys who came regularly to my house when I was writing: Lincoln and Carter. Robbie climbed up so his blue shorts were level with Annie’s eyes. She could see his back pocket had bulgy bits where he’d put his little things, what he called his shinies: small stones and bottle tops and dice and Lego bricks and walnut shells. They weren’t all shiny, really, but their dad said Robbie was a magpie and magpies liked shiny things, so that’s how they came to be called that. Annie could see the way Mrs. Hedge had cupped her branches around Robbie and was watching him closely. Just a glimpse of her eyes, and then they were gone. “Worms,” said Robbie, and he pushed one hand into his back pocket. Out came a broken rubber band. Robbie wiggled it in front of his nose, sniffed, then pushed it back where it had come from. He fiddled around some more. A cotton reel. String. Then a fat thing that was brown and pinkish. It wriggled. “Here, Bud,” Robbie said, and dropped it into the nest. “Yes, he did,” said Mrs. Hedge. “Thank you, Robbie.” And the leaves parted, and there were the leafy eyes. Robbie didn’t see them—he was too busy watching the nest. “In one gulp!” said Robbie. Robbie stayed as he was. Annie tugged again—sharper this time—and the pocket wriggled. A cute something was in there. She let go. Wind. Sending the wire fence twanging, billowing the sheets on the line, pushing and shoving its way between Annie and Robbie and the Hedges, roaring in their faces. Mrs. Hedge’s mouth moved but didn’t make a sound as she struggled to keep a grip on the nest. Mr. Hedge gripped Mrs. Hedge. 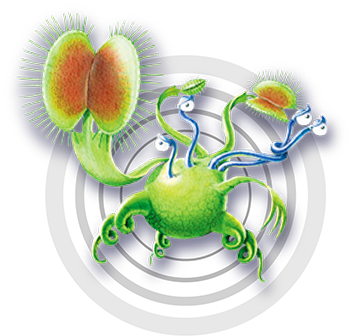 When you start coming up with ideas for turning particular carnivorous plants into sentient mutants – what are some of the things you think about? Sabrina: I always need to think about how the creature will move around, and how it will perform whatever actions are required by the story. Dion’s roots, for example, became his way of getting around; and his traps came in handy for things like opening louvre windows. The eyes have always been particularly important, because they’re one of the most important ways of showing the creature’s thoughts and emotions. Other parts of the creature can be helpful with that, too — for example, Dross’s leaves can look bedraggled, or lively and excited; and similarly with his eye stalks. Of course, these things are always decided in consultation with the author and designer! Do you use real plants or photos for reference (or both)? Sabrina: I use real plants when I can, but photos can be useful too, especially if I’m drawing while a plant has died down for the winter. Venus flytraps, for example, can look very poorly during the winter months. How do you make the plants’ eyeballs express emotion? Sabrina: Eyelids are the crucial thing: without them, it’s much harder to show emotion. They can take on some of the job of eyebrows — pulling down for a frown, narrowing together to show suspicion, or rolling right back in fear. The eye stalks can be helpful, too — if they’re rearing back, it can convey fear, and lunging forward can show aggression. Okay, if you were Bette Noire – and you could create a mutant plant or animal in your lab – what might it be? Sabrina: A cow with cheesecake-flavoured milk. Oh, and edible brussels sprouts. 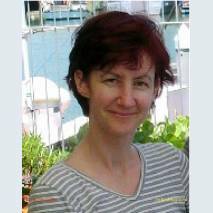 Sabrina is the illustrator of all The Fly Papers books, and also an author. Last year she wrote and illustrated a beautiful picture book: Blue Moon Bird. If you’ve been following the adventures of Spencer, Tora, and their friends in the first two books of The Fly Papers, you know that the kids still have a lot of mysteries to figure out. Luckily they’ve got six more books to do it in! People often ask if I’ve planned what’s going to happen all the way through to the eighth book. When I first started writing book one, my answer was, ‘Mmmm … kind of.’ I had a vague resolution that I aimed get to at the end of book eight, but that was about all. The wise and generous author Fleur Beale took me in hand and told me (nicely) that I needed to do better than that. She warned that if I didn’t have a very clear idea what was going to happen throughout the whole series, then writing it would be dangerous. I might get to a point later in the plot where I was stuck and would suddenly realise I should have written things differently earlier on. So I came up with a few paragraphs of plot description for each book, but deep down, I knew it might not be enough to save me from a plot tangle. Well. First they wanted to know more about every book’s storyline. So I began feverishly developing the plot in more detail than I’d ever tried to do before. I was a bit disappointed, but not horribly, because I’d been trying not to get my hopes up. I was also grateful. I now had pages and pages of plot information to work from, all the way through to the end of The Fly Papers. P.S. All these lovely character illustrations from The Fly Papers are by the marvellous illustrator Sabrina Malcolm. Hi everyone – I’ve been looking forward to being your March author. I do. Growing up, my favourite book series was The Three Investigators. I longed to discover this gang was real and join them as investigator number four – I mean, they really did need a girl. I also loved those mysteries you have to solve yourself, like the Encyclopedia Brown stories – except I got impatient and looked up the answers. Then I’d feel angry at myself and try to brainwash myself into believing I’d worked them out on my own. The stories I love writing are also mysterious ones. The Fly Papers is full of mystery. I’ll talk more about it soon, but you can read the first episode here – and solve the first of its mysteries. November 2013 sees a month-long celebration of Michael Morpurgo’s wonderful stories, marking his 70th birthday this year. We’re celebrating by highlighting some of our favourite Michael Morpurgo stories, including Shadow. Life in Afghanistan is terrifying for Aman and his family and they want nothing more than to escape. When a Springer Spaniel appears in the mouth of their cave, Aman nurses the dog back to health. The dog is like a “friendly shadow” that stays with Aman and his family and so he decides to call her Shadow. When life becomes more dangerous, Aman and his mother leave their home and escape, with Shadow leading the way. One of the things I like about Michael Morpurgo’s books is that you often get two stories in one. In Shadow you get the story of Aman and Shadow, but also the story of Matt and his grandfather who fight to free Aman from the refugee detention centre in England. There are sad things that happen in the story but there are also plenty of good things that happen, like Aman finding Shadow. Lauren Child is the author of the fantastic Ruby Redfort series. If you like action, adventure and mystery stories, check out the Ruby Redfort books in the library. Do you love sinking their teeth into a new series? Do you love books like The 39 Clues, The Infinity Ring and Conspiracy 365? Scholastic have just released a new series, called The Last Thirteen, that’s perfect for fans of these series and anyone who loves a fast-paced story full action, adventure, and mystery. Sam wakes from his nightmare to discover the terrifying reality. It will come true. Kidnapped from school and finding out his parents aren’t who he thinks they are, Sam is suddenly running from danger at every turn. Nothing will ever be the same again. With his life and identity shattered, Sam’s salvation is tied to an ancient prophecy. He is in the final battle to save the world, up against an enemy plotting to destroy us all. He alone can find the last 13. The first book in The Last Thirteen series has just been released and James Phelan kicks it off with a bang. The first book sets the scene for the rest of the series, so we find out snippets of information about Sam, the Last Thirteen, and the organisations that want to get their hands on them. The Last Thirteen are a group of teenagers with a special ability that some people will kill to get their hands on – their dreams come true. Sam is the first of the 13 and the race is on to find the other 12 in order to save the world. The plot races along (especially in the second half of the book) and the chapters are short, so readers will gobble it up and be waiting for the second book. Each of the books ends with a dramatic cliff-hanger, and the end of the first book certainly makes me want to read the next one to find out what happens. Like similar series (39 Clues, Infinity Ring) there is a dedicated fan website, where fans can register online and gain VIP access to a range of exciting features. There’s also the chance to enter the competition, with your chance to become famous. The Last Thirteen is perfect for ages 10+ who love action, adventure and mystery. Get your copy today and join the race to find the Last Thirteen. Win a copy of The Last Thirteen! Thanks to Scholastic NZ we have 2 copies of The Last Thirteen to give away. All you have to do to get in the draw is enter your name and email address in the form below. Competition closes Wednesday 18 September.